There is a normal experience, then there is “an experience”. What is this experience? “Experience is the result, the sign, and the reward of that interaction of organism and environment which, when it is carried to the full, is a transformation of interaction into participation and communication” (John Dewey 22). 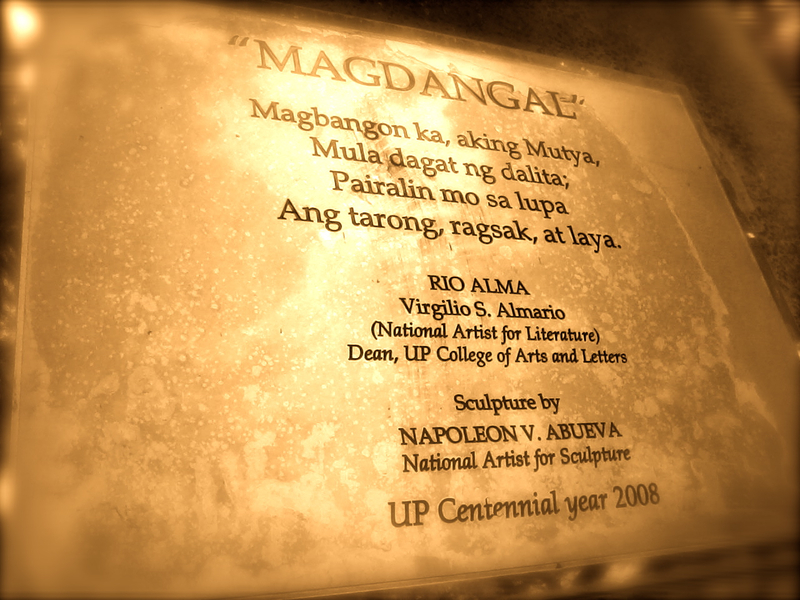 This came to mind as I sat right in front of Magdangal, a sculpture by Napoleon Abueva (National Artist for Sculpture), in commemoration of UP’s Centennial year. What was I doing there? I was smoking. Smoking is something I am not proud of. Last time I smoked regularly was my undergrad years in UP, also around the time when I was writing my thesis. 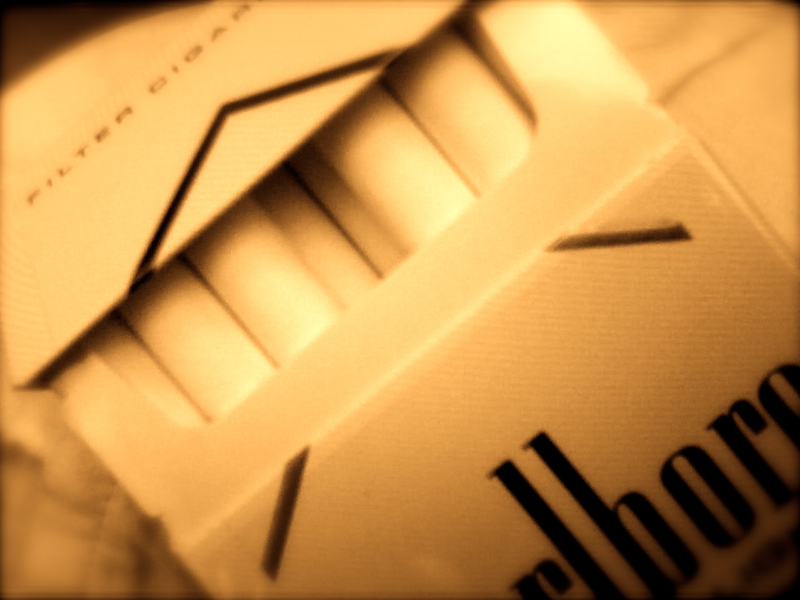 There was something quiet and sublime as I open a pack of cigarettes, light one up and just sit and stare at Magdangal. “Because experience is the fulfillment of an organism in its struggles and achievements in a world of things, it is art in germ. Even in its rudimentary forms, it contains the promise of that delightful perception which is esthetic experience” (19). It was indeed, an art in germ. “Only when the past ceases to trouble and anticipations of the future are not perturbing is a being wholly united with his environment and therefore fully alive. Art celebrates with peculiar intensity the moments in which the past reinforces the present and in which the future is a quickening of what now is” (18). I have been reading and thinking too much. There are times that I just need to come up for air. Thus the reason for this habit that I went back to. The present is rushing too fast towards the future. In a way, that is a good thing, as I can’t stay here forever. But from time to time, I need to stop and just feel the intensity of the moment. Again, I read this poem. I know that it is not intended for people to smoke around this sculpture, but a lot of us do. It is not in disrespect. But as I said, there is something so quiet and sublime about this place. You may ponder in front of a work by a National Artist, along the circular benches surrounded by trees. Right in front of you is the new CAL building, finished after so many years of construction. Right there in Magdangal, I had “an experience”, an aesthetic experience so rare in the rush of the present. I am a live creature. “Life grows when a temporary falling out is a transition to a more extensive balance of the energies of the organism with those of the conditions under which it lives” (14). **This reflection is informed and inspired by John Dewey’s Art as Experience (1934). Now, you go light that cigarette and have fun. In other words, it’s time for a leisurely smoking session or make that sessions!!!!! I smoked liked a chimney when I was in Baguio. Not only was it typical of the Baguio aesthetic I was going for, (using aesthetic in the broadest sense here. HAHA) the weather sort of required it. And there was simply nothing better than lighting a smoke at night in the middle of Baguio’s perpetual chill and just TAKING IT ALL IN. ;) Figuratively and literally! This is sooo art people of us 🙂 There’s just something about it, right? I feel like I am wrapped up in a bubble, separated from everyone by smoke. You just observe your surroundings, almost like a flaneur. Nothing can get to you, just a quiet moment with you and the smoke. Dewey does make sense, tho. Magda is Magda. Best place to smoke is at the back of Vargas. I’m sure more can be said of the scenery there. And the changes as of lately. I hope the new cafe opens soon. Cafe Iana has bad coffee/food, but they have a great location. The P35 tea is the best, because its a tea bag in hot water. Haha! Let’s wait and see. Oh, now you can check out the blog. Still in its test broadcast stage tho. 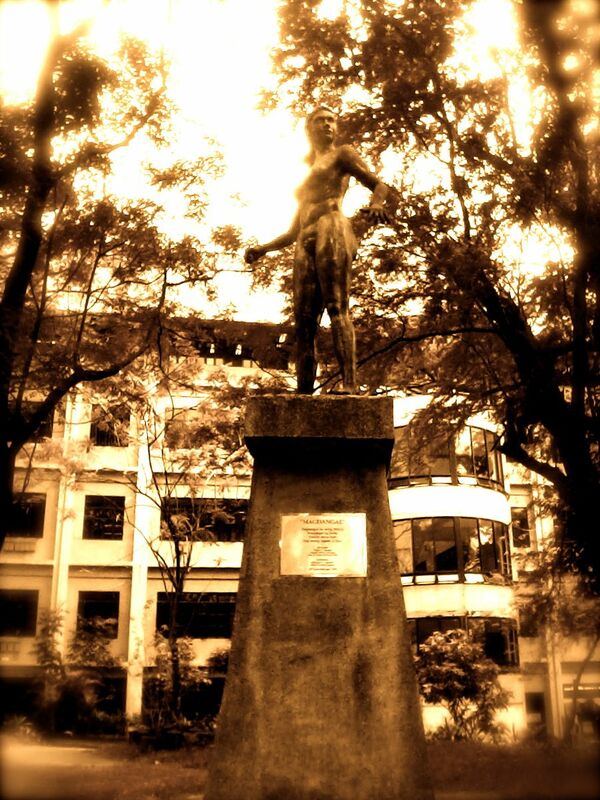 This entry was posted on February 2, 2012 by Portia Placino in Diary of a Grad student, Random Writings and tagged "an experience", Aesthetic Experience, Art as Experience, CAL, John Dewey, Magdangal, Napoleon Abueva, smoking, sublime, UP.